In 2019 the Congregation will celebrate the faithful lives of 49 Jubilarians and a collective 3,185 years of dedicated ministry and presence. 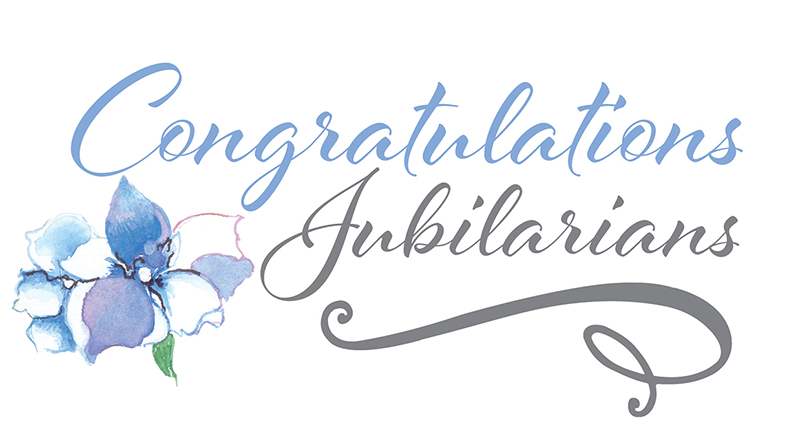 The Jubilee Class includes three 80-year Jubilarians; eight 75-year Jubilarians; 12 Double-Diamond (70-year) Jubilarians; 23 Diamond (60-year) Jubilarians; two Golden (50-year) Jubilarians; and one Silver (25-year) Jubilarian. The Congregation also honors the memory of 20 deceased 2019 Jubilarians, who are celebrating in Heaven. *2018 Jubilarian, celebrating with 2019 crowd. Let us remember the deceased 2019 Jubilarians who are watching over in constant prayer as they mark their jubilees with the Communion of Saints.